Mickey Quickie Quilt - Finished! So, a few months ago, I made this delightful cheerful Mickey Mouse birthday banner for my nephew's party. 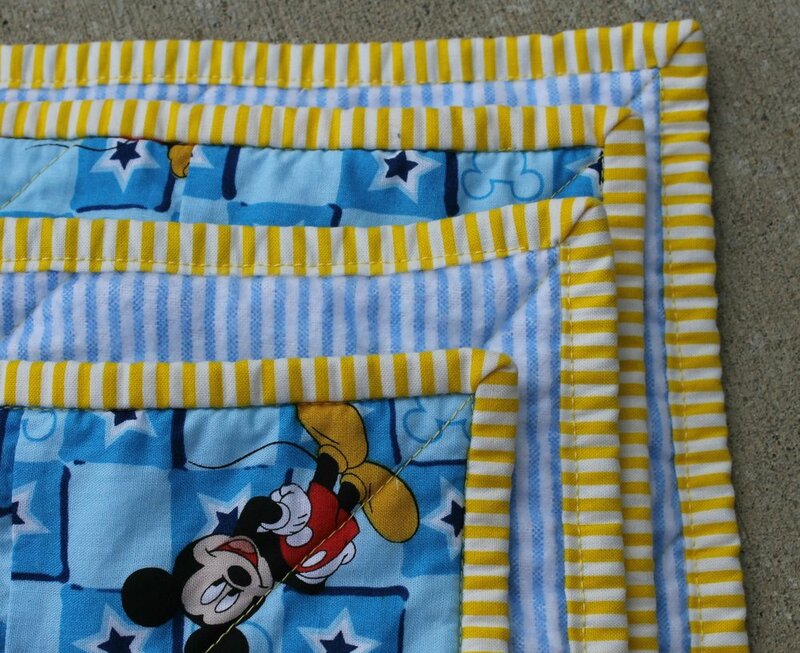 Given that I'm not one to waste fabric, I left the Mickey and took everything back with me, to find out that our newly starting local Modern Quilt Guild was donating quilts to the NICU this quarter. Well, that made everything easy. During one of our sew days, I starched the heck out of the strips and assembled these rail-fence-like blocks. Assembled the top, whipped on a border, and I had a top! I snagged some flannel from our MQG stash that was ALMOST big enough. But, well, cutting a strip of stripe off the side to make it wide enough means the stripes would be "the wrong way." And so, since I didn't really do anything "modern" on the front, I decided to embrace the "wrongness" and just put the stripe in. Not even in the center! And I love the tiny bit of visual interest it gives to the back. Especially with the simple cross hatch quilting. Added some yellow striped binding from my stash, and finished it up in time to hand it off for this quarter!